Google might become the next Exxon once the The Atlantic Wind Connection project is completed. The transmission backbone will provide approximately 6,000 MW of offshore wind capacity, enough power to serve 1.9 million households, when fully complete. Good Energies, an experienced investor in the development of renewable energy projects across North America, Europe and Asia, will invest 37.5% of the development capital alongside Google and Marubeni Corporation. The development of the project is being led by the independent transmission company, Trans-Elect. The largest U.S. offshore wind farm project to date. 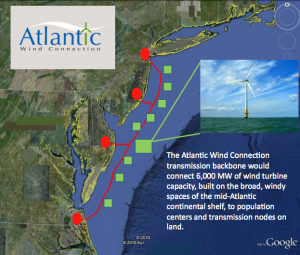 The Atlantic Wind Connection is a proposed string of offshore wind turbines that will stretch 350 miles off the Atlantic coast from Virginia to New Jersey. Once completed, the project will produce 6,000 megawatts of power, which is equivalent to 60 percent of all the wind power built in the U.S. last year. The wind project will serve nearly 2 million homes.